The inner central region is filled with temperate valleys and the South is where the steamy tropical jungles are found. Restrictions on the numbers of tourists help to preserve the country's natural assets and a way of life that has remained unchanged for millennium. 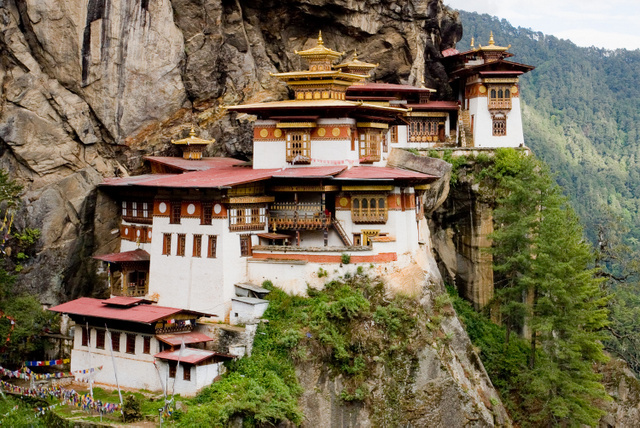 Visitors will see monasteries perched at the tops of mountain peaks, ancient Buddhist art and sculpture, dense forests and spectacular valleys. Early morning flight to Paro, Bhutan (Please check the flight timing). The flight from Delhi/Kathmandu is considered as one of the most scenic flight offering the view of the world’s top ten highest peaks. Upon your arrival in Paro airport our guide will be there to welcome you and transfer to Thimphu. After Lunch visit the Memorial Chorten (temple) built in memory of the late 3rd King. This place now happens to be a get together point for the elderly people, who spend their whole day chanting prayers and meeting their friends. 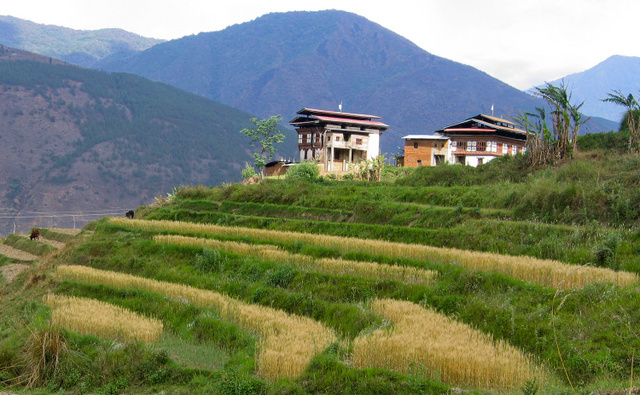 Visit Changangkha Lhakhang, the oldest temple in the valley offering a beautiful view of the valley. Enclosure where the national animal, Takins are kept and drive to visit the largest and the newly built statue of Buddha offering magnificent view of entire Thimphu valley. 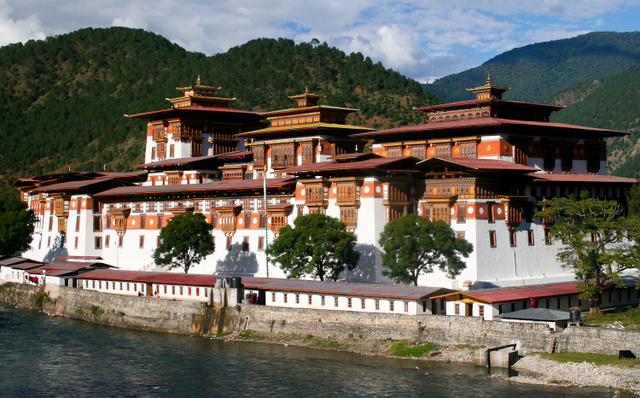 After 5 PM, visit the fortress of Thimphu, Tashichho Dzong, which houses the throne of the king. Evening walk around the happening town, the largest and the most crowded town in Bhutan. 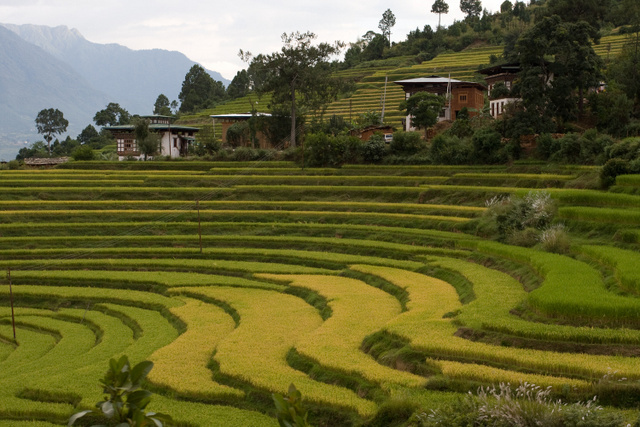 If you are staying in hotel Meri Puensum, hotel Zandopelri or hotel Densa, early morning it will be a treat to walk up to the hilltop to visit the nunnery and interact with the nuns and enjoy the magnificent view of Punakha and Wangdi valley. Later after breakfast start your drive for Trongsa. En route could stop for a short hike to the ancient village of Rinchengang overlooking the ruins of Wangdi Dzong. It’s amazing how they have managed to be together and preserve the old houses. If you are bit tired, could do it on your way back. Cross over the Pelela Pass at 3,300m which forms the part of Black mountain range that divides the country into east and west. Enroute could take a short break and go for short hike to the remote village of Rukubji or Chendibji. The drive is long but the landscape is picturesque and worth. On arrival relax in the hotel. Morning walk through the single lane town of Trongsa and visit the majestic Trongsa Dzong (Fortress), the home of the royals. 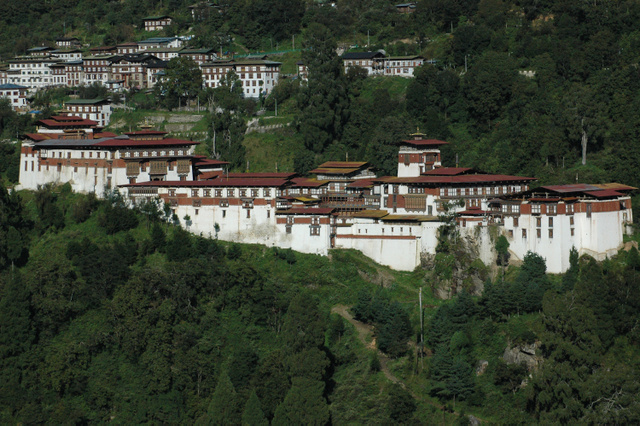 Historically Trongsa Dzong is the most important Dzong and the largest as well. Later must visit the Ta Dzong, an ancient watchtower, which houses a unique museum. Later start driving for the remote village of Tang, crossing over Yotong La pass at 3,400m. After a short descend en route just before arriving Jakar, stop in Chumi valley, the weaving place, by the roadside where “Yatha” (wool weaving) is woven here which Bumthang is famous for. Continue your drive crossing over Kiki La pass stopping in Jakar for a short while. After Jakar, most of the drive is through the dirt road, Tang being a remote village. The road might be bumpy but the landscape is beautiful crossing through many small villages. Just before reaching Tang village, if you want to avoid driving, you have an option to take a shortcut by crossing the bridge and walking for about half an hour to the guesthouse, O’Chholing palace, the ancestral home to the royal family of Tang region which is converted into a museum and a very basic guesthouse. Very very few tourists get to visit this village. Enjoy the calmness and the beautiful view of the Tang valley. It’s a quite little village, which got electricity recently. Morning walk around the tiny village, meeting the locals, the shy children and interacting with them. Witness their morning village activities. Later after breakfast, visit the unique museum of O’Chholing, which has very fine and unique collection of Bhutanese Arts and Artifacts. It covers and explains about all the history and details of Tang village activities during the olden days. Later after lunch bid farewell to the family of the museum and walk down the valley and catch your car to drive back to Jakar. Morning start retracing your drive to the remote isolated valley of Phobjikha passing by Trongsa town and crossing over Pele La pass. The drive is very picturesque and worth every turn and climb. This valley is protected being winter home for the endangered Black Necked Cranes migrating to Bhutan every end of Oct to end of Feb. This valley is a paradise for the nature lovers and hikers. Upon your arrival could go for a short walk in the valley. Or if you are too tired after the long drive, could relax in the hotel and enjoy the breathtaking view of the valley. This is a very remote village and the hotel standard is very basic. Being protected, this valley got electricity recently only. Farm house stay optional. Morning could go for walk right below your hotel and meet the school children who all walk for hours to reach their nearest school. After late breakfast could go for Phobjikha Nature trail hike (2.5 Hrs), which offers beautiful view of the valley. It starts from the valley and end with Gangtey Goempa temple at the hilltop overlooking the valley. Gangtey Goempa temple is a beautiful temple, richly renovated with many monks living. Rretrace the drive back to Paro crossing over Dochula La pass. Upon arrival in Paro, visit Paro Dzong (Fortress) on foot and continue walking through the oldest wooden bridge still in use. Continue further to stroll around the old Paro town and peep into some local handicrafts stores. Could get some opportunity to see the traditional game, Archery match going on. Evening back to the hotel. Morning drive to Chelela Pass, 3800m one of the highest motorable road in Bhutan. If the weather permits one can view the most scared and the highest mountain peak in the country Mt. Jomolhari (7314m) overlooking at you. Walk around the pass with prayer flag fluttering and enjoy the fresh air. Afternoon back to the hotel. Later visit Paro Dzong (Fortress) on foot and continue walking through the oldest wooden bridge still in use. Continue further to stroll around the old Paro town and peep into some local handicrafts stores. Could get some opportunity to see the traditional game, Archery match going on. Evening back to the hotel.